The 31-year-old has a suspected hamstring problem. "Yes, we're worried. You're worried about any injury," boss Chris Hughton told BBC Radio Norfolk. "We don't know much yet. He's felt his hamstring slightly. We don't think it's a big one but we won't know until the next couple of days." 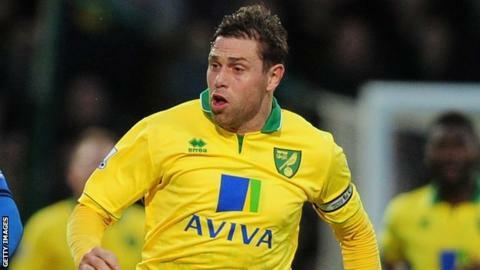 Grant Holt is seven goals away from surpassing Jack Vinall as Norwich's fifth highest all-time goalscorer. Vinall scored 80 goals for the Canaries in the 1930s. Only Johnny Gavin (132), Terry Allcock (127), Iwan Roberts (96) and Robert Fleck (84) have scored more. Holt, Norwich's top scorer for the last three seasons, has started every game in his side's current 10-match undefeated Premier League run, but hobbled off in the latter stages against the Latics. And the Canaries, who are now up to seventh in the table, will be hoping he recovers in time to face three of the top six over the Christmas period - West Brom, Chelsea and Manchester City. "It's a concern - and a bad time," added Hughton. "But it's not right to speak about it in bad terms when we don't really know. "Hopefully he'll be OK. If not, the competition within the side continues." Norwich's goals against Wigan were scored by midfielders Anthony Pilkington and Wes Hoolahan, with the latter also signing a new deal until 2015 at the weekend. Pilkington, who drove home the first before providing the cross for Hoolahan to head the winner, said of the Republic of Ireland international "He's a great player. He's probably the best player I've played with. "You see his foot work and how good he is on the ball. It's great that he's here for the next three years - it's great for him and great for the club."